Genuine U.S. Military Surplus M548 Ammo Cans are must-haves for portable storage. Each is gasketed to seal out the elements and built to take punishment. 100% waterproof. 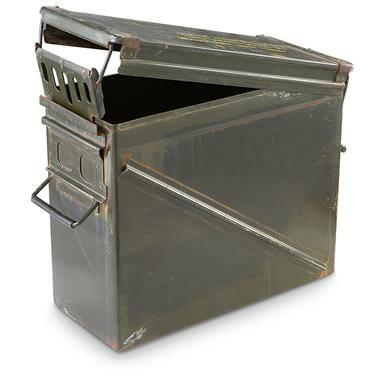 U.S. Military Surplus M548 20mm Ammo Can, Used is rated 4.7 out of 5 by 99. Rated 5 out of 5 by Mack from Well constructed Fine ammo can. I thought you might be shipping it by Pony Express, but all in all, a good ammo can at a reasonable price. Rated 5 out of 5 by retired1 from MORE CANS!! Did you ever meet someone with "enough" ammo cans?? I haven't!! These are good for any type of storage. Get yours while you still can... My cans arrived with good seals, good outside, and clean inside! JUST what I want. AND you don't have to carry them home from the gun show... Good price and very good service from Sportsman Guide. Rated 5 out of 5 by John from better than the picture I ordered a Boat Load of these. All of the cans were in better shape than the pictured example, except one...It had been crunched at one point in its life. A couple of good tugs and a whack, and it also was better than pictured. All in all I would place my cans in a solid 95% condition! Let's put it this way, I just ordered more!!! Rated 5 out of 5 by old man Bob from Good Price Received exactly as described and pictured. Very nice condition. Fast delivery. Rated 5 out of 5 by Ready from Sturdy storage container. Excellent condition, roomy interior, good price. Converted into EMP protection storage. Rated 4 out of 5 by countrygent from Ammo can Good price and a good sealed container for ammo, reloading supplies, etc. Rated 5 out of 5 by GobblerK5 from Great value for these I'm using these as toolboxes in the bed of my truck. I ordered two of them and they both arrived in great shape! Almost like brand new! Free shipping was my deciding factor in ordering from SG. Hope they can continue offering that. I've already painted the boxes gloss black to blend in better in my truck bed. I will be bolting them to the bed of my 2004 Silverado Crew Cab with the 5'8" bed. The boxes fit perfect in this location.